Merritt College’s Urban Arboriculture Program was created in response to a large demand for trained arborists. The curriculum in planting and caring for trees has been developed specifically to meet the needs of the industry. 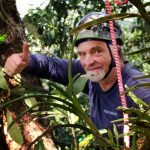 Eric Folmer will be teaching the tree climbing courses.